Peak gold represents a watershed event for the yellow metal. Gold miners and gold investors alike have anticipated this moment for years. In short, peak gold is the year in which gold miners extract as much of the yellow metal out of the ground as they ever will. Since 2015, production from gold mines has been flattening, according to data from Metals Focus. If the estimates for 2017 prove correct, peak gold happened in 2016. 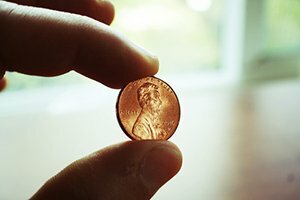 Metals Focus foresees a further decline this year. "We're pretty close to [peak gold] if we're not at it," World Gold Council Chair Randall Oliphant told Bloomberg last September at the Denver Gold Forum. Peak gold will fundamentally change the gold market by permanently restricting supply. And that in turn will serve as a major catalyst to gold prices and gold mining stocks for… well, forever. Gold miners are always searching for new deposits to replace their depleted mines. Spending on such exploration tends to rise when gold prices are high, and miners can afford it, and fall when gold prices decline. It takes 10 to 12 years from the time gold is found to when a gold mine goes into production. But a gold mine is productive for 10 to 30 years. Until recently, the exploration cycle had succeeded in finding sufficient gold to keep production rising. 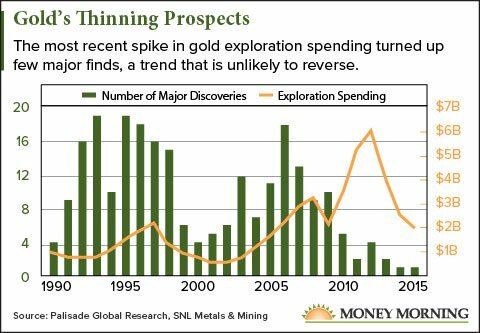 Right now, gold miners should be reaping the benefit of a spike in exploration spending from 2006 to 2008. But they're not. The gold discovered in that period was barely enough to keep production flat. And the situation is guaranteed to get much worse in the decade ahead. While gold miners spent about twice as much on exploration in 2010 to 2012, new gold discoveries plummeted. And over the past year, spending on exploration fell again. "We just haven't been finding the new gold deposits, there hasn't been an interest in bringing on as many mines as we have in the past, and a lot of companies have declining production profiles," Oliphant said. And it's not just the number of discoveries that's fallen. Gold finds in recent years have been much smaller. "If you look back to the 70s, 80s and 90s, in every of those decades the industry found at least one 50+ million ounce gold deposit, at least ten 30+ million ounce deposits and countless five to 10 million ounce deposits. 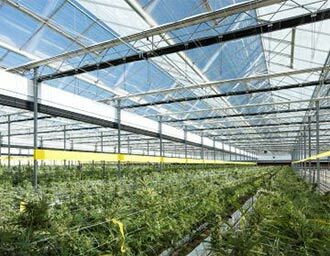 But if you look at the last 15 years, we found no 50 million ounce deposit, no 30 million ounce deposit and only very few 15 million ounce deposits," Pierre Lassonde, chair of gold royalty and income stream company Franco-Nevada Corp. (NYSE: FNV), told German financial newspaper Finanz und Wirtschaft last October. In addition to the global production numbers, several of the world's leading gold producers are experiencing or expecting significant declines. Gold mining production in China, the world's top gold miner, fell 9.8% in the first half of 2017 (the most recent data available), according to the GFMS World Gold Survey. The report also forecast that Chinese gold production would continue to drop for the foreseeable future. Meanwhile, MinEx Consulting predicted last year that gold mining in No. 2 producer Australia will peak in 2021, just three years from now. That report estimated a drop in Australian gold production from 11.3 million ounces in 2021 to 6.65 million ounces by 2035. But the most telling signal that we've reached peak gold is the collapse of production in South Africa. After peaking at an astonishing 1,000 metric tons in 1970, by 2016, gold production had plunged 83%. Once by far the world's leading gold producer, South Africa is now ranked sixth. 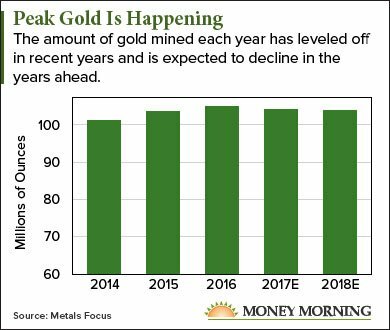 The shrinking supply is bound to drive prices up as gold-buying demand at least remains steady in 2018 and beyond. This is the perfect storm gold investors have been waiting for.